One of my favorite things to do is looking at pics of other people's studios. I have spent over a decade designing, redesigning, creating, recreating, and assembling my studio. I am always on the lookout for better arrangement ideas and storage options to make the most of my little tiny space. 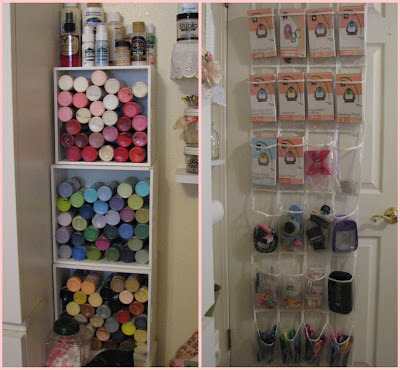 These pics show some of the ways I store my supplies. 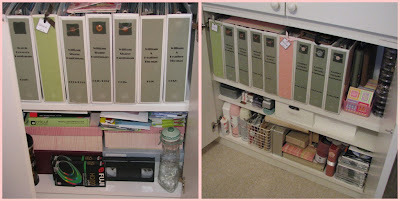 I have been told that I have alot of stuff...my husband teases that I could open my own scrapbook store! I will admit, I have spent alot of money on supplies and storage pieces. 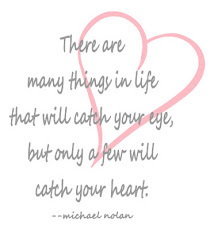 But, I have been collecting and gathering for years. And, I believe this to be an investment in the most valuable thing my family and I have...the preservation of our memories. 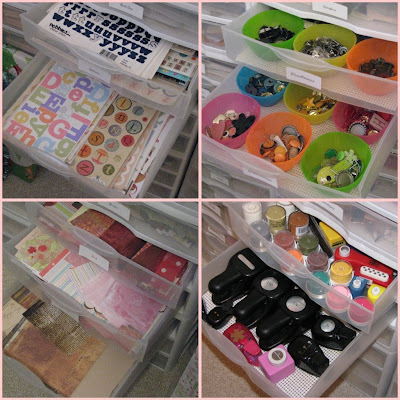 One of my favorite storage items is my 12 x 12 plastic drawers, bought at Walmart. Because I can see through the fronts of the drawers, it makes it easy to find what I'm looking for. 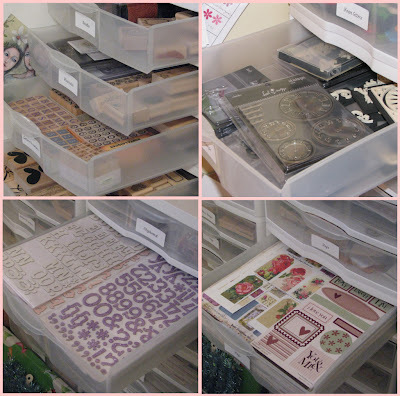 I store my stamps, chipboard, tags, stickers, embellishments, etc. in the drawers. I also store my paper scraps (by color) this way. 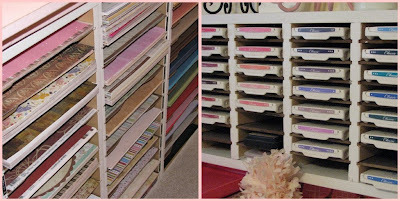 Under my big, pink work table, which my husband built for me, are the paper racks (also built by dh) that hold all of my 12 x 12 paper, both cardstock and patterned. On the wall, I have a big rack that holds all of my stamping pads. (again, built by dh) Don't know what I'd do without him. I have four cabinets, (bought at Home Depot) which are stacked on the floor, that hold alot of my stuff. This one is my ribbon/flower cabinet. 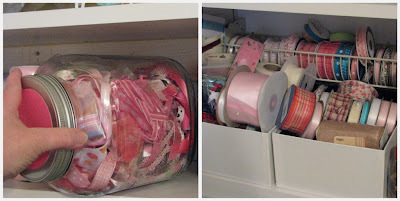 I have ribbon in jars, (Walmart) and spool ribbon in little wooden boxes (Walmart) and a metal rack (thrift store). I also have flowers stored in this cabinet. This cabinet holds my chipboard letters, buttons (on the left door), brads, eyelets, etc. 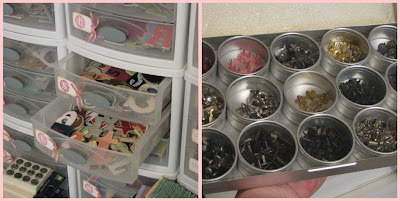 My chipboard letters are stored alphabetically, by letter, in little plastic drawers (Walmart), and my small embellishments are in watchmaker boxes (bought on line). Both bottom cabinets, house my kids' scrapbooks, extra photos, and misc. supplies. Behind the door, I lay my paints in little wooden boxes, so I can see the colors easier. And on the back of the door, is a plastic shoe bag? that holds cartridges for my Cricut, and misc tools. If you have any great storage ideas, I'd love to hear them! wow girl... you are ORGANIZED!!!! I am going back to look at this post again... I need to take notes. This is my first visit to your blog and my word!! you ARE organized girl I love it. I bet you dont spend that 15 minutes looking for the pair of scissors you just put down somewhere...Thats me, 15 minutes I could get a lot done but looking for my supplies and tools =)I love your blog and I will be back.